What a fantastic servant he has been to Wales. And to northern hemisphere rugby in general. 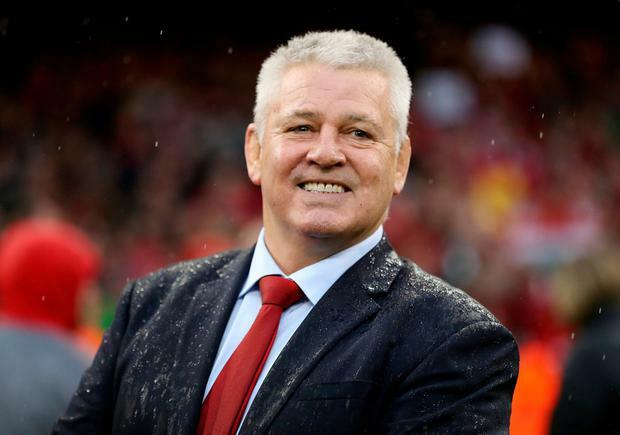 Not that anyone needed convincing but a third Grand Slam, and a fourth Six Nations crown, since he took over the reins in 2007 really is an extraordinary achievement. All the more so when you consider the chaos going on in Welsh regional rugby. What I liked about this one was the spirit Wales showed when they were under the cosh. They never panicked. You cannot fake that. Gats is a master at getting the best out of those around him. Wales are going to miss him. With Joe Schmidt also bowing out, the Six Nations is losing two of the best coaches it has had. Both have transformed the rugby in their respective countries. You can think of more exciting players. Josh Adams was a revelation for Wales. Joe Cokanasiga's impact against Italy was electrifying, but he was outshone by Manu Tuilagi in that game. Tuilagi's return has been a joy to watch - long may he stay fit because he has shown that there is still a special player in there. Much more than just a one-trick pony. But for his impact on the team around him, his honesty, his graft, his refusal to give in, it has to be Jones. He was immense again against England, despite being on one leg. They may not have won the title, but England thrilled us the most. That opening win against Ireland was absolutely stunning. Right from the first minute, with the long throw-in to Tuilagi which threw Ireland completely, they were on it. They now have a clear identity, and a clear idea of how they want to play: dominant in the tackle area, clever attack. Also, a clear idea of what their best team is. You could not have said that last autumn. A big step forward. The 35-phase attack which led to Hill's try against England was a wonderful demonstration of efficiency, accuracy and commitment to keep the ball. That summed up Wales's tournament. Hadleigh Parkes's try yesterday showed superb execution under pressure to take the momentum away from Ireland. Also deserving a mention is Henry Slade's at the start of the second half against Ireland - perhaps the most exhilarating in an attacking sense. That whipped pass out to Jonny May and then the pace he showed to collect his team-mate's chip. Again you could make a case for Josh Adams here, but Curry, who only got his chance after Sam Underhill's injury, has been a revelation. His physicality, his work at the breakdown, his ability to get England on the front foot. . . Is it a coincidence that the last time England had a genuine No 7 they won the World Cup? What a waste of what is arguably the most exciting back line in the northern hemisphere. Antoine Dupont, Romain Ntamack, Gael Fickou, Thomas Ramos... it is such a shame the French cannot get their act together because they have the players. Knowing them, they will make the World Cup final now. Conor O'Shea always makes a point of saying that Italy are not looking for sympathy, they are looking to win games. So it must be incredibly dispiriting getting beaten every week. They gave Wales and Ireland a tough time, but after letting another game slip through their fingers yesterday, the bald truth is they have lost 23 in a row and been whitewashed in the Six Nations for a fourth successive year. Yet I believe Conor has done an outstanding job considering the tools he has to wok with. Italy are a better organised team with a higher skill level than two years ago. It is a tough one. I have got nothing against Georgia being part of the Six Nations but I think they should have to beat Italy to get there - and when those two played each other last November,Italy won comfortably. They are caught in a bit of a limbo at the moment. Hamish Watson's impact for Scotland when he came on against Wales last weekend was pretty special but Biggar was the difference between Wales winning and losing that all-important game against England in Cardiff. Superb.